kailash123p (6/30/2011 7:33:09 AM): flat to positive open wwith extremely volatile session ahead..
U.S. stocks on Wednesday extended their winning run to a third straight day as Greece approved debt-reduction measures and Wall Street prepped for closing the books on the second quarter. “The market has been rallying, in theory at least, on Greece getting financial aid and trying to work its way out of the debt rash that they’re in,” said Paul Nolte, managing director at Dearborn Partners. The following is combined FII trading data across NSE and BSE collated on the basis of trades executed by FIIs on 29-Jun-2011. The following is combined Domestic Institutional Investors trading data across NSE and BSE collated on the basis of trades executed by Banks, DFIs, Insurance, MFs and New Pension System on 29-Jun-2011. Please read instructions before placing your trade order . 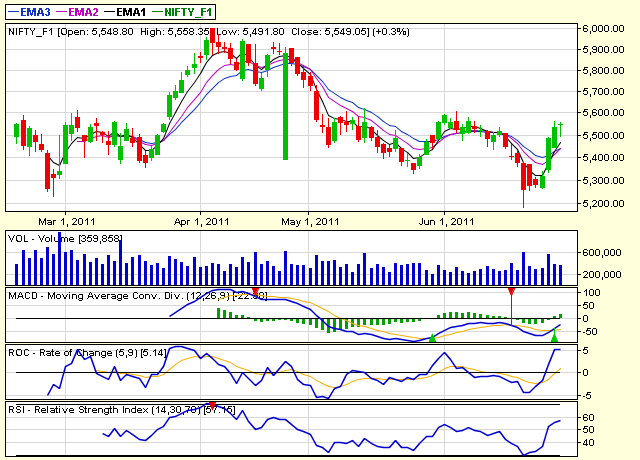 Gap up opening is expected with extreme volatility ahead ...Traders started rolling over and squaring off of June contracts....FIIs were net buyers in equities ,index futures ,options and net sellers in stocks futures... . 5520-30 is very important level now as 50 and 100 DMA are positioned there, 2 sessions left ..tomorrow will be expiry of this month contacts and a new cycle will start ..
Bank stocks lagged Tuesday’s market rally, pressured by concerns over whether Greece’s Parliament will approve certain austerity measures that are critical to its acceptance of a debt-assistance package backed by the European Union and International Monetary Fund. At risk is $114 billion in aid that is contingent on Greece’s agreement to specific austerity measures and the accelerated sale of certain state assets. Without the package, Greece is in danger of failing to meet debt obligations due in July and August, which would seriously strain certain European and U.S. banks. Pado added he believed Monday’s upswing in bank stocks was more of a “relief rally” staged by investors, who had feared the new capitalization requirements for major banks drafted this past weekend in Switzerland would be harsher. “We believe MasterCard’s current multiple is not reflective of the uniqueness and earnings power of the underlying business model. While ongoing regulatory concerns will likely prevent MasterCard from ever achieving its peak multiple again, and the best days of pricing power are likely over, we see room for upside to 2011/12 consensus estimates,” Jefferies said. 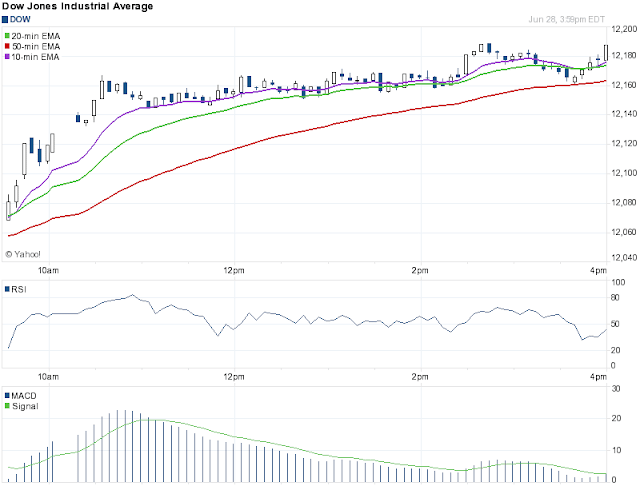 The hanging man is a bearish reversal pattern that can also mark a top or strong resistance level. 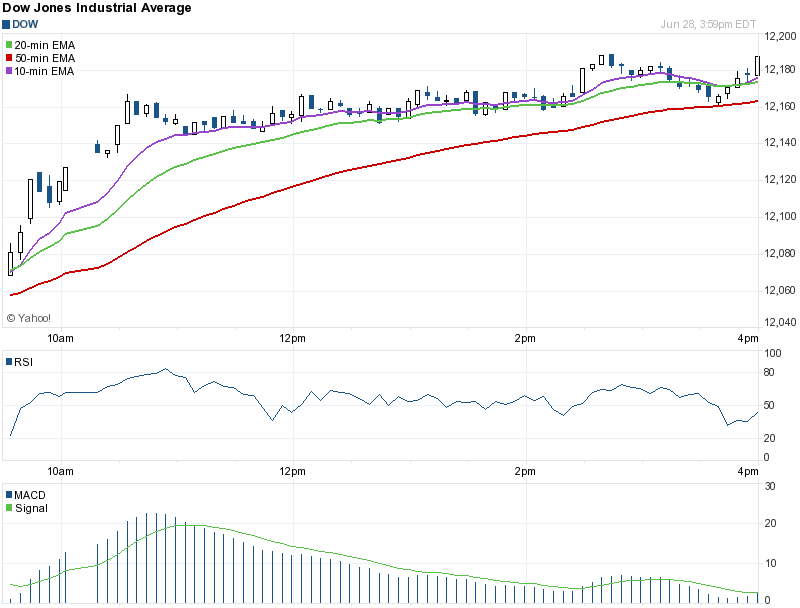 When price is rising, the formation of a hanging man indicates that sellers are beginning to outnumber buyers. 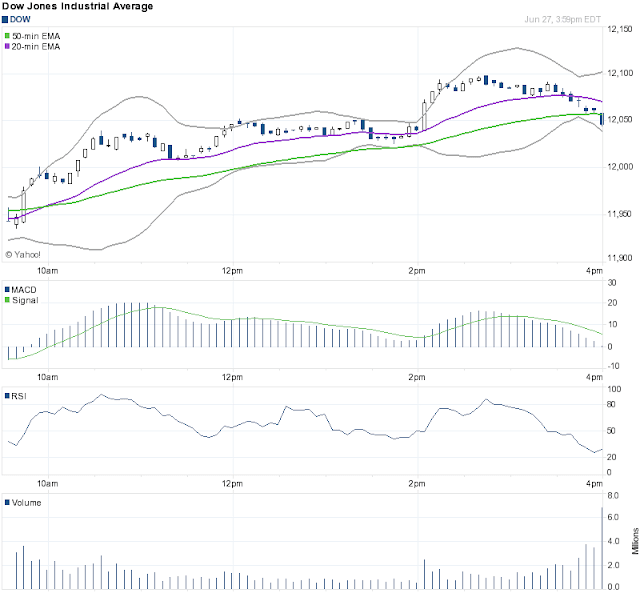 The long lower shadow shows that sellers pushed prices lower during the session. 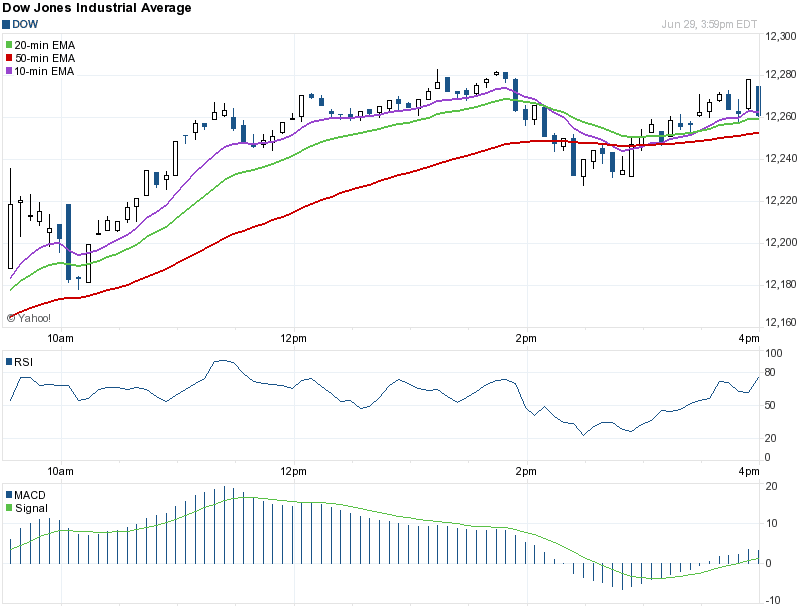 Buyers were able to push the price back up some but only near the open. This should set off alarms since this tells us that there are no buyers left to provide the necessary momentum to keep raising the price. . The following is combined FII trading data across NSE and BSE collated on the basis of trades executed by FIIs on 28-Jun-2011. The following is combined Domestic Institutional Investors trading data across NSE and BSE collated on the basis of trades executed by Banks, DFIs, Insurance, MFs and New Pension System on 28-Jun-2011. 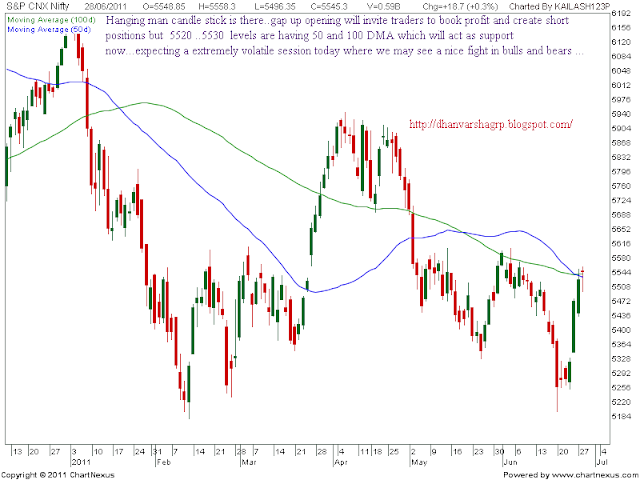 BPCL traded as per its direction and gained.. 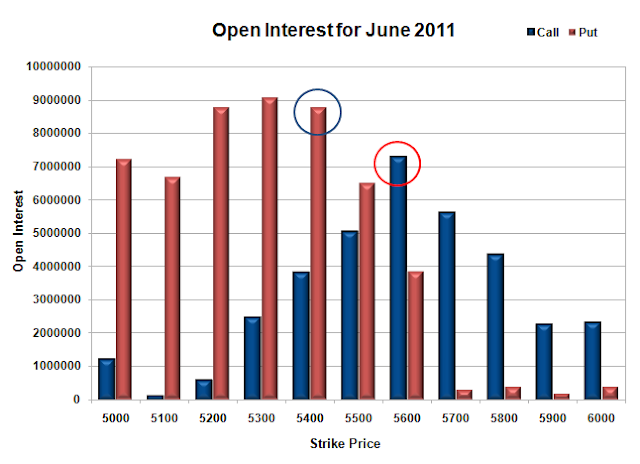 Positive to gap up opening is expected with extreme volatility ahead ...Traders started rolling over and squaring off of June contracts....FIIs were net buyers in equities and sellers in index and stocks futures... . 5530 will work as pivot point, above it play long and below it be cautious ..trade according to Nifty levels ..
Nifty OI table is showing that put writers were highly active in market ..and 5400 5500 and even 5600 puts were written yesterday..
Stocks rose from three days of losses on Monday, led by banks after news of more favorable capital requirements and optimism over Greece's austerity plan, but investors cautioned against high hopes. 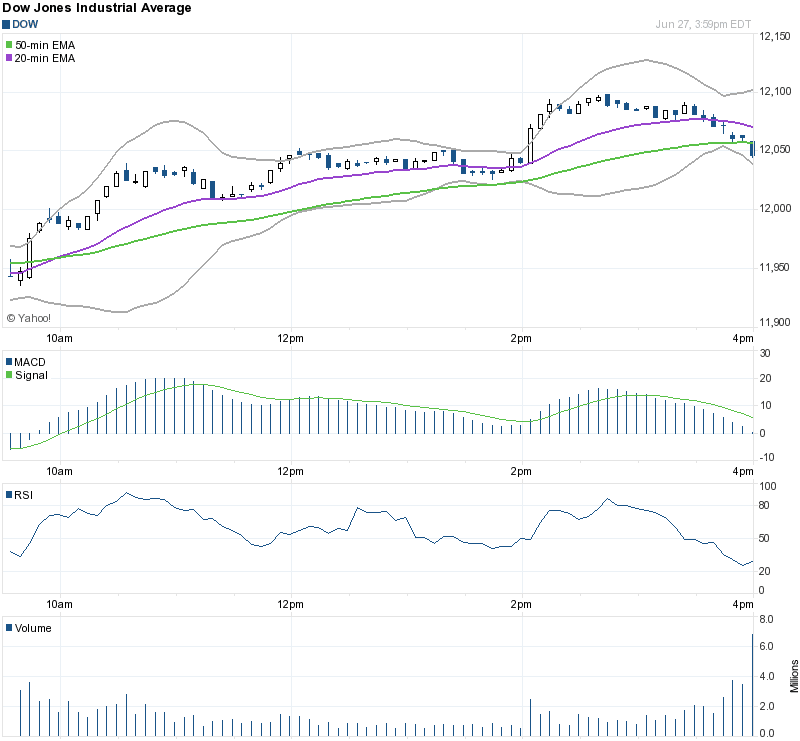 Monday's gains were a welcome sign of strength but investors were cautious about reading too much into the move. 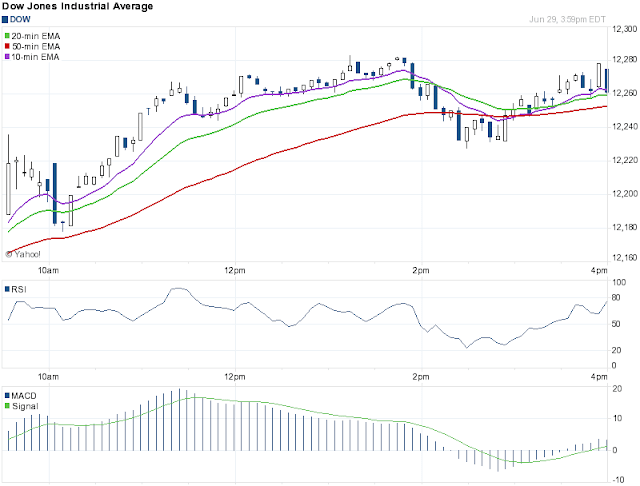 The S&P 500 has fallen as much as 7 percent since April and Monday's volume was lower than average. "We don't see this being the start of a major rally," said Tim Ghriskey, chief investment officer of Solaris Asset Management in Bedford Hills, New York. "But this is welcome strength in the market and hopefully a welcome short-term bottom." 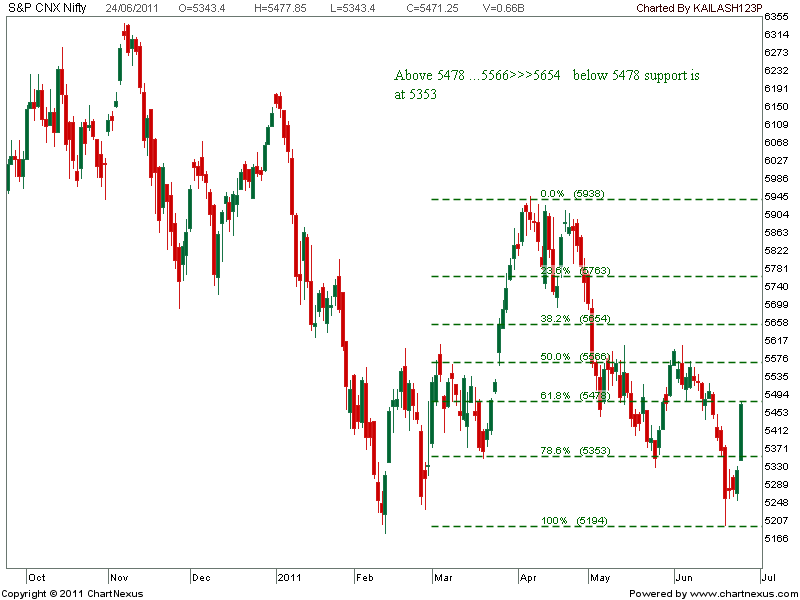 Nifty daily chart showing resistances at 5538 and 5568 ..and below it 5524 light support.. The following is combined FII trading data across NSE and BSE collated on the basis of trades executed by FIIs on 27-Jun-2011. 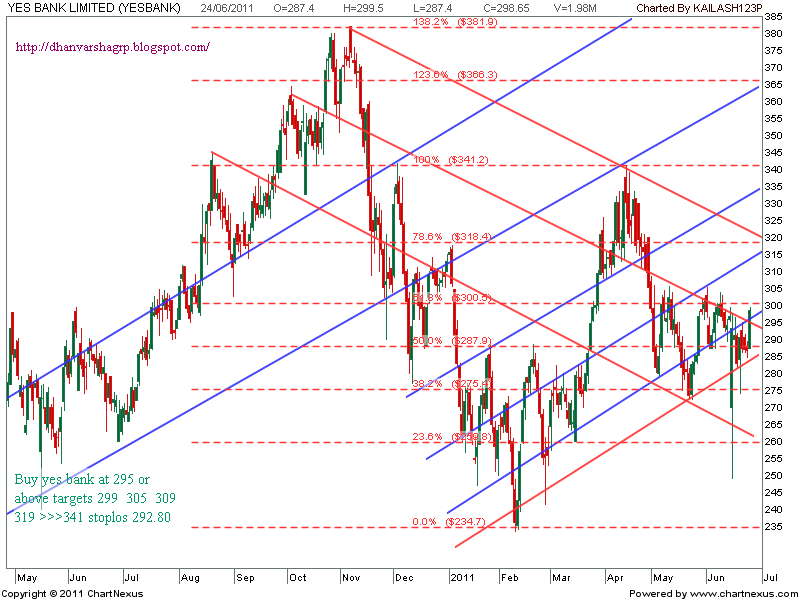 The following is combined Domestic Institutional Investors trading data across NSE and BSE collated on the basis of trades executed by Banks, DFIs, Insurance, MFs and New Pension System on 27-Jun-2011. 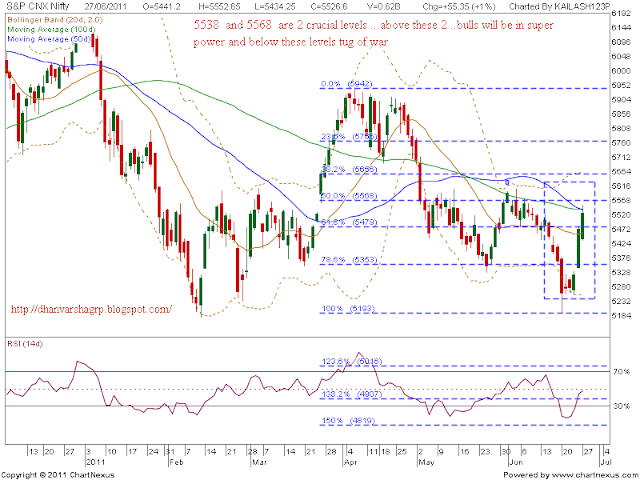 Will OMC's share price move up / down...? Tata steel call worked well. Nifty closed at 23.6% fib level ..
Nifty futures traded in predicted range ..
why NIFTY failed to move above 5555?